One thing a lot of people ask me about is the price of steak at Peter Luger. You can’t find prices on their own Web site, and not even on sites like Yelp. The main reason for this is: prices fluctuate a lot. So much so that the menu is printed without prices, and prices are actually hand-written. On my last visit in August, these were the porterhouse prices. A steak for two would run you $93.90. A steak for three would go $140.85. Steak for four costs $187.80. They do sell single steak at $45.95, but at a very minimum you want to get the steak for two to ensure you have the finest cut. Of course, your mileage may vary, but that should give you a good idea of how much money you need to set aside. A reminder that they don’t take credit cards, so you need to bring a debit card, a Peter Luger card, or a big wad of cash. Something else I was very, very happy the last time I went in August was that I actually had room for dessert. We ordered the apple strudel and a scoop of ice cream, which did the job of filling me up to capacity. To my delight, the waiter was more than generous with the schlag! 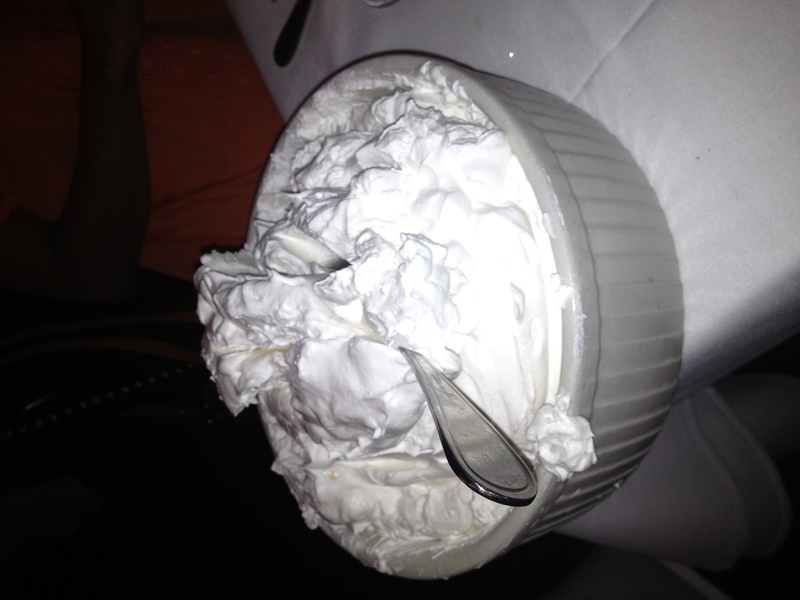 Schlag, if you don’t know, is a heavenly whipped cream that goes on every dessert Peter Luger sells. If I could shave with it I would. As promised, I said I’d share with you some additional thoughts and pictures when I made a return visit. It didn’t take long–I went back with friends on January 8. My friend Ken was returning from Vegas, where he said he paid a ton for a steak in Mario Batali’s restaurant that was supposedly aged for 9 months. I won’t go into the grisly details, but suffice it to say that he told me immediately upon returning that he had to return to Luger’s to get the memory of that steak out of his head. It was divine. I don’t think I can eat tomatoes any other way anymore. Next, came out the steak. We got a Porterhouse for 3 this time. I started snapping pictures, and then our server Elmir noticed and suggested I take a video to capture the sizzle, one of the signature features of Peter Luger steaks. Here’s how it looked (and sounded). Note how the server always laps on a little drizzle of sizzling oil to make sure your first bite is tender and succulent. The original plan was for us to eat a little and then for Ken to bring the leftovers home. Suffice it to say we cleaned up. Ken asked our server about how long the steaks were aged, mentioning the steak he had in Vegas. Elmir was extremely kind and was a veritable expert on steaks. He said that it was ridiculous to age a steak for that long, as steak isn’t like wine. The perfect length of dry aging is 4-6 weeks, not months. The beef is hung in giant slabs (a la the movie Rocky) in huge coolers directly underneath the restaurant and kept at a constant humidity and temperature. After they’ve aged, they’ll have a blue cheese-like “shell”. The meat is a gorgeous red color at this point and is cut into porterhouse steaks. The leftover beef that isn’t cut into steaks is ground into Peter Luger burgers. That’s right, the burgers that Luger sells for lunch is made of the very same beef that their steaks are made of–at a fraction of the cost. He implored us to come and try any day of the week before 4. The steak is then put under an 800 degree broiler. As it nears readiness, it’s cut up, put on the plate, and then finished under the broiler (which is why the plate is hot when it comes out). I have to say, I really appreciated this “insider’s look” at why these steaks are so phenomenal. It only made me reiterate the 5 stars. This is a Great Neck gem. As I mentioned in my introductory post, I don’t dole out 5-star reviews on this site very often. A 4-star review means I enjoyed the meal very much and would go back. A 4.5-star review means I would love to go back. A 5-star review means I MUST go back. 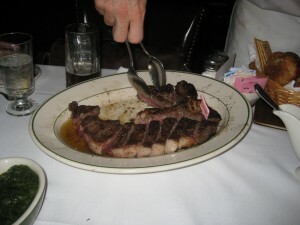 It’s probably no surprise that the first Great Neck restaurant to get this rating from me is Peter Luger’s Steak House. Its iconic Brooklyn location, of course, is the one that gets most of the hype and most of the celebrities. But the Great Neck location’s steaks are just as dry aged, the interior design the same classic German beer-hall atmosphere, and the waiters that same combination of big and gruff-but-lovable. Given the price tag of this place, a lot of people come on special occasions, so through the course of a typical night you’ll hear at least one or two serenades of a group of big beefy men singing “Happy Birthday” in their German accents. Despite the astronomical price tag (which we’ll cover below), the dress code of Peter Luger isn’t overly fancy. Don’t go in wearing shorts or T-shirts or flip-flops, but you will be fine wearing business casual garb. Even jeans and a neat shirt or blouse is fine. The key is to think business casual or even casual but not too casual. 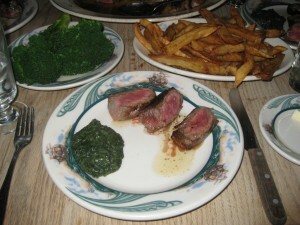 Peter Luger is a good example of a restaurant that does one thing and does it very, very well. They make porterhouse steaks (if you’re in the mood for any other kind of cut, there’s always Morton’s up the road). They ship their beef in from the Midwest, and meat is selected for excellent marbling (pink with an even distribution of fat throughout). It’s dry-aged on site in a temperature controlled cooler. Once it’s aged, it’s butchered and brought the the kitchen for broiling. 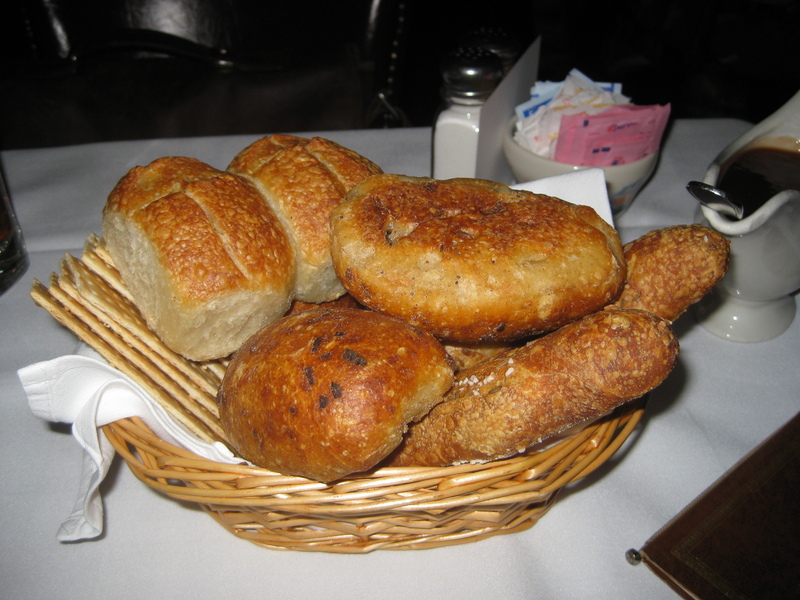 You start the night with a bread bowl. It’s a variety of hard German bread, including onion bread, pretzel-like bread, and some delicious flatbread. 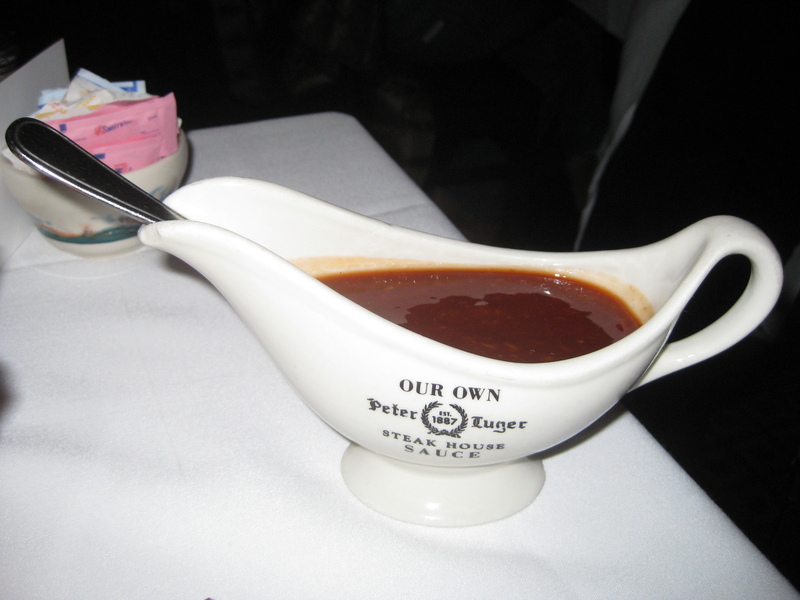 Then comes the Peter Luger steak sauce. This steak sauce has gotten so famous people can even buy bottles nationwide at Brookstone on Amazon.com . Some have described it as ambrosial. Honestly, I wouldn’t go that far. But there is something very special about it. It has a sweet, tangy flavor that’s somewhere between steak sauce and cocktail sauce. It goes fantastic with meant (just a dip, not slathered on), but also tastes surprisingly good on big slices of tomatoes. Finally, the star of the show: the porterhouse comes out. Here’s the steak for two. 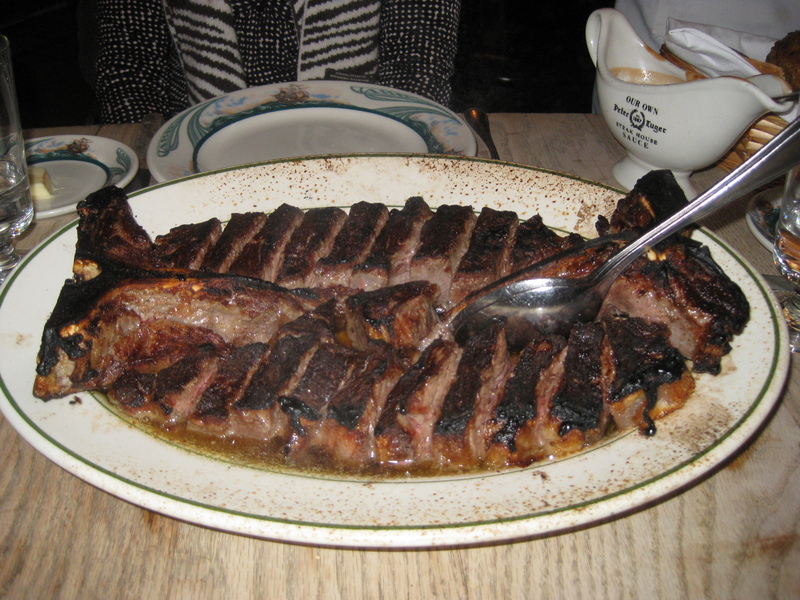 The porterhouse steak for two is very good, but I later discovered for the full Peter Luger experience you need to get the cut for 3 or 4. This is where you get the most tender, flavorful, juicy goodness. (I’ll have to make a return visit to get you pictures of those). The waiter carries it out on a very hot plate where the oil is still sizzling. The steak is pre-sliced on the platem and when you tilt the plate the sizzling oil runs down. I’d recommend getting the meat medium-rare; the plate is hot enough so that if you want to continue to sear it you can. The waiter will use two spoons to serve each member of your party, and drizzle a little bit of oil over each one to make doubly sure you have a succulent and juicy first bite. You can pour on the Peter Luger sauce afterward, but I definitely recommend taking that first bite without anything added so you experience it right. What can I say about this steak? You don’t just taste it, you experience it. The flavor is a perfect beefy flavor, the steak cuts like butter, and each chew envelops your body with a spectacular feeling. Whatever you can’t finish, you take home in an insulated bag. This way you can gnaw on the T-bone and fight over it with the dog in the privacy of your own home. While the porterhouse gets all the attention, there are some other stars. First, the fresh tomatoes are a must-have. Aside from giving you some psychological comfort that you’re eating something healthy amid the pools of saturated fats, the tomatoes go exceptionally well with the Peter Luger steak sauce. 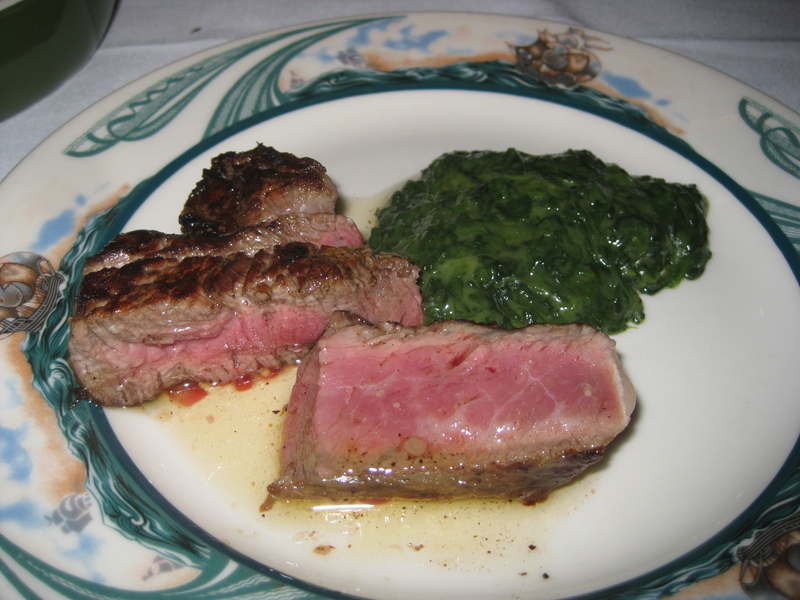 Another must-have side is the creamed spinach. 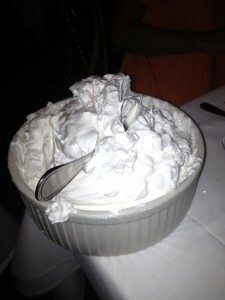 As impossible as it is, leave room for dessert, which comes with plenty of homemade “schlag” (whipped cream). 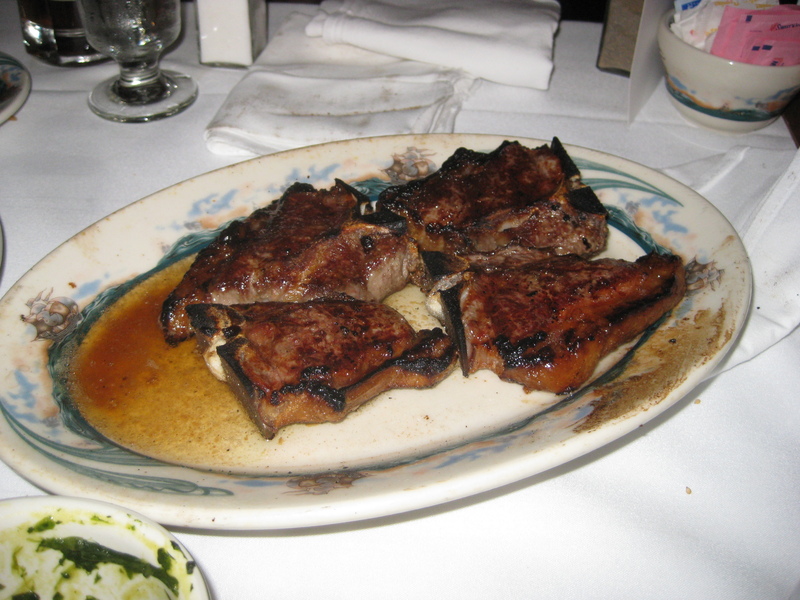 One thing that a friend of mine turned me on to was the lamb chop. Now I’m not someone who eats lamb, I’ve just never liked the flavor. But this was phenomenal. 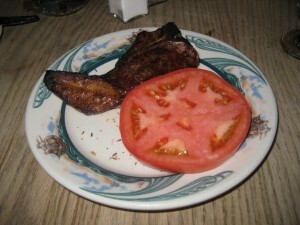 It was broiled to perfection with a delicious rich flavor. I couldn’t even tell it was lamb. A couple tips when eating at Peter Lugar. First, be sure to make reservations any day of the week; this place is always busy. Second, bring cash or a debit card, as they don’t take credit cards. Third, be prepared to spend a lot of money, maybe more than you’ve ever spent at a restaurant. And be sure to go in with the proper expectations. Most of the “disgruntled” reviews I’ve read on Google and Yelp are from people whining that the staff wasn’t polite up to their standards (I mean, come on, they’re big German men whose job is to serve meat) or that they felt that the steak wasn’t quite up to the hype (as you can tell from my review above, it’s hard to describe it without getting a little hyperbolic). So no, this is not a life-altering or life-changing experience. What it is is simply great steak. Your review is spot on. I’ve been eating @ Lugers for 40+ yrs, nothing better, period. The boys are correct in the tip section,the bacon is a MUST for an appetizer. Sold by the slice, tastes very similar to canadian bacon and just as thick,salty and juicy. They also have their own dark beer, Lugers Lager or something like that , terrific, made in Bklyn by Kelso Beer Co. try it. How would you compare Peter Luger to other high end steakhouses of nyc?